‘Infrared scan’ and ‘infrared scanning’ are terms that are commonly used to describe an infrared inspection. While these terms have been around for decades, few thermographers know their origin. At the heart of every thermal imaging system is a solid state component known as a detector. When exposed to infrared radiation, the detector produces a signal which is converted by a thermal imager’s electronics into the two-dimensional visual image that appears on the monitor screen of the thermal imager. Prior to the advent of focal plane or staring array detectors which may contain hundreds of thousands of pixels, early thermal imagers contained relatively few elements in their detectors. These early thermal imagers relied upon a sophisticated optical system that scanned the target repeatedly in order to produce an image. Because of this, thermal imagers were often referred to as ‘infrared scanners’. This gave rise to the term ‘infrared scan’ when referring to an infrared inspection. Thermal imagers that relied upon optical scanning mechanisms remained popular until just after the turn of the century when they were largely replaced by microbolometer imagers due to their low cost and image clarity. Although infrared scanners are rarely used today, many people still refer to infrared inspections as infrared scans. Free IR Videos for Your Website! For nearly 40 years, Infraspection Institute have prided themselves on providing world-class training, certification, and support for infrared thermographers from around the globe. As part of our commitment to supporting our graduates and the profession of thermography at large, Infraspection are pleased to announce a unique resource for practicing thermographers – video FAQs (Frequently Asked Questions). Produced by Infraspection Institute personnel, our video FAQs provide accurate, straightforward answers to the most commonly asked questions in thermography and thermal imaging. Hosted online by Infraspection Institute, these short videos (less than 60 seconds) are available to anyone wishing to add professional content to their website(s). Subscribers are able to select the questions which are most appropriate for their website. Participation is voluntary and one may opt out at any time. Best of all, this unique service is provided FREE of charge. Each year lightning kills an average of 67 people in the United States; hundreds more are injured. Few people really understand the dangers of lightning and many fail to act promptly to protect their lives and property. Thunderstorms are most likely to develop on warm summer days and go through various stages of growth, development, and dissipation. On a sunny day, as the sun heats the air, pockets of warm air start to rise in the atmosphere. When this air reaches a certain level in the atmosphere, cumulus clouds start to form. Continued heating can cause these clouds to grow vertically upward into “towering cumulus” clouds. These towering cumulus clouds may be one of the first indications of a developing thunderstorm. 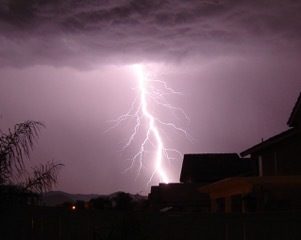 During a thunderstorm, each flash of cloud-to-ground lightning is a potential killer. Whether a particular flash could be deadly depends on a person being in the path of the lightning discharge. In addition to the visible flash that travels through the air, the current associated with the lightning discharge travels along the ground. Although some victims are struck directly by the main lightning stroke, many victims are struck as the current moves in and along the ground. Lightning can strike as far as 10 miles away from the rain area in a thunderstorm. That’s about the distance you can hear thunder. When a storm is 10 miles away, it may even be difficult to tell a storm is coming. If you can hear thunder, you are within striking distance and should seek shelter immediately. Infraspection Institute are pleased to announce an early registration bonus for exhibitors at our annual IR/INFO Conference. Exhibitors that register and pay for their booth prior to September 15 are eligible to bring a second person at no additional charge. Valued at $595, this bonus provides full conference access, conference proceedings, and a tuition voucher redeemable for a discount on an Infraspection Institute Certified Infrared Thermographer® training course. Now in its 30th year, IR/INFO is the original Advanced Infrared Training Conference, Technical Symposium, and Technology Expo. IR/INFO features four days of networking, learning, and fun in a professional, yet relaxed, family atmosphere. IR/INFO is scheduled for January 20 – 23, 2019 in New Orleans, LA. IR/INFO is a must-attend event for all manufacturers and distributors of infrared equipment, condition based monitoring tools and services, reporting software, and those who provide products or services of interest to thermographers.